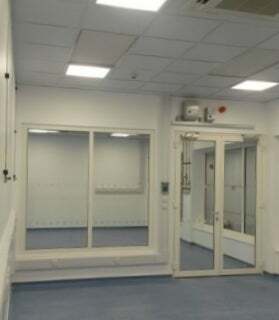 Wrightstyle, the UK-based steel and aluminium glazing specialist, has supplied a range of doors and screens to the Science and Technology Facilities Council (STFC) that carries out research in science and engineering, as well as funding research into, for example, space science and astronomy. Wrightstyle’s customer for the project was SAS International, and the systems were installed at RAL Space, based at STFC’s Rutherford Appleton Laboratory, which has had significant involvement in more than 200 space missions. STFC works closely with the UK Space Agency and overseas agencies, including Nasa, universities and industrial companies, working on projects from other countries, including Australia, Japan, Morocco, Pakistan, Russia and the European Union. Wrightstyle supplied both single and double-door systems, and screens, to RAL Space’s new technology Centre in Didcot and which will be home to a number of advanced space test chambers, clean rooms and thermal vacuum chambers, used for testing spacecraft or their components. The systems provide 30/30 insulation and integrity, including smoke. Wrightstyle systems mitigate against fire, ballistic and bomb threats, but are also specified here and internationally. The company’s systems can be found from the US to Australia, and from the Middle East to the APAC regions.